For those of you that like the ‘perfect’ look that fine denier stockings bring, but prefer the convenience, feel and freedom of a truly ‘bare’ leg, Calvin Klein Sheer Essentials 15 Denier Knee High Socks let your lower legs and ankles look their best with their fantastically sheer, silky matte appearance. 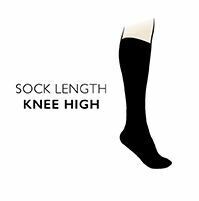 Calvin Klein Sheer Essentials 15 Denier Knee High Socks are American manufactured fine legwear with flat, extra-comfortable, turned-and-stitched stretch comfort top bands. They also have a sheer, sandal-ready seamed toe, that has been invisibly reinforced for durability.